To be entirely truthful, I'm fed up with losing this book and this will be the 5th and very last time I replace it (and it definitely won't be 'loaned out' to anyone ever again, never!). 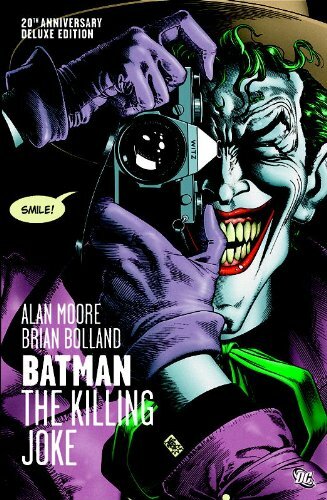 Clad in a new hard cover with Brian Bolland taking on colouring duties for this 20th Anniversary edition of (arguably) The Joker's darkest outing ever, it's not difficult to see why so many people stole my copy (yes stole, because I'd never willingly give anything this good away to anyone). Origin stories are always tough to get right. Die-hard comic fans will always grumble and moan if someone comes in and interferes with an established character's genesis and it's always puzzled me why any new 'Superhero' movie or reboot feels the need to shove origin stories down your throat time and time again (please, spare us from ever seeing Peter Parker's uncle murdered, or Bruce Wayne's parents buying the farm in a dark alley). But the Joker's origins? That's something that's been lightly touched on in movies (not difficult to see how Tim Burton used a few ideas from "The Killing Joke" in his first Batman flick) but never with a note that makes you feel sympathetic to the gibbering lunatic's plight. Starting out with Batman visiting the Joker in Arkham, and finding out that someone's pulled a switch and the Joker has escaped, we're soon spiralling on a rollercoaster ride of madness and violence courtesy of the clown prince of crime. I think the main reason I love this graphic novel so much is because Batman takes a back seat. He's there briefly in scenes where he is merely a foil to the Joker's chaotic and directionless psychotic behaviour, gunning down Barbara Gordon (that scene is one of the most brutal I've ever seen in a comic but you'll probably argue I don't read the right comics) and kidnapping Commissioner Gordon for no better reason than to lure Batman to his doom. In the present day this plotline is fairly cliched and throwaway (Oh look, the Joker's found yet another dismantled Amusement Park to turn into a criminal base!) but it's when the story digs right into the Joker's early life as a failed comedian turning to crime to support his pregnant wife, his emergence as "The Red Hood" and his eventual transformation into the Joker after falling into a chemical pit that lifts this story right up there into the higher echelons of Bat-legend. After almost 20 years without a copy, it's been refreshing to see Bolland's work restored in this way, with all the original colouring by John (Watchmen) Higgins removed, linework subtly improved and new digital colours added by Brian himself. Flashback scenes feel vastly improved with highlights picked out in stark contrasting colours to compliment the fantastic character artwork (Bolland's Joker is by far the ideal image of the character, closely resembling the mania and pure evil of 1940s Joker from the old Batman comics). Though many will argue the backstory doesn't fit with whatever sprawling and disjointed universal arc the Batman mythology has crawled on its guts through, this really depicts why The Joker is the way he is, why he doesn't care, and why no holds are barred when it comes to his pure evil because he really doesn't have anything to lose and really couldn't care less what he gains. The 20th Anniversary edition also contains a short story reuniting Bolland with Batman for an imagined would-be assassin's fantasy of killing Batman. "The Man with No Name" shows that Bolland could've carried on producing the definitive version of Batman ad infinitim (but then again you could say the same of anything he's ever been involved in, his work is that good and I sorely miss his superior versions of Judge Dredd and Judge Anderson / The Dark Judges). Coming back to this has made me realise why I kept lending it out though, why I wanted to convince people it was worth reading and why it never came back. It's astonishingly good and if you've never read it you might as well give up comics and take up fly fishing instead. "Batman: The Killing Joke" by Alan Moore and Brian Bolland is still in print and if you want the definitive version of this masterpiece, this is it.